This is the first English-language military history of what the People's Republic of China called the "War to Resist U.S. Aggression and Aid Korea." Based upon a vast array of recently available Chinese sources, it provides a revealing new look at the far-reaching influence of Mao Zedong's political and military thought on China's conduct of the war. As Shu Guang Zhang reminds us, many observers in 1950 thought it foolhardy for this young and underdeveloped communist nation to engage in yet another war. Coming so soon after its costly civil war with the Nationalists, the Korean crisis presented China with the uninviting prospect of fighting a technologically superior (and nuclear-armed) opponent on foreign terrain. Mao, however, was convinced from more than a decade of fighting against the Japanese and the Nationalists that political gain and warfare were inseparable. ("Political power grows out of the barrel of a gun," he'd declared as early as 1927.) 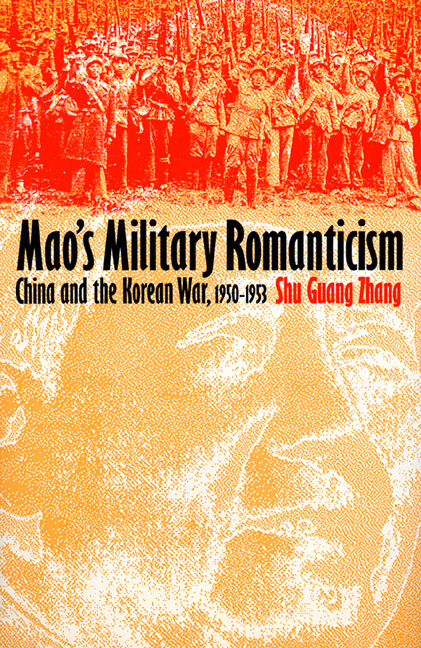 Zhang argues that war in Korea offered Mao yet another opportunity to expand and consolidate his political power at home, while at the same time uniting the Chinese proletariat against Yankee imperialism and proving to the international community that China had arrived as a major world power. As Zhang shows, Mao's decision to go to war against the United States was guided by a devoutly romantic belief that human forces would always triumph over modern technology. Victory, according to Mao, did not necessarily go to those who had bigger and better guns. It was reserved instead for those who possessed an unwavering commitment to a superior cause. Merging the martial thought of both Clausewitz and Sun-Tze with Marx's concept of class struggle, Mao galvanized China's military and citizenry at every level to fight a people's war against Yankee imperialism. Fueled by Mao's call to safeguard China and East Asia from American invasions, the Chinese showed how a relatively outgunned but inspired fighting force could deprive a technologically superior opponent of victory in a limited war. As Zhang concludes, subsequent conflicts in Vietnam and elsewhere have proven the value of that lesson. Shu Guang Zhang is associate professor of history at the University of Maryland and author of Deterrence and Strategic Culture: Chinese-American Confrontations, 1945–1958.